This is one of the lead questions asked in behavioural interviews. Usually asked to throw the candidate off-guard. Daily routine of a person is a mirror of that person’s personality. It shows how much he/she is ready to face the world. One’s daily routine shows how much the person values discipline in their life. Usually when asked about what is your daily routine question, try to explain how you basically start the day, how long you have been following this routine and what is your favourite activity in the routine and why. You should also explain what you do in your typical day to day life. This question can have different aspects. For example, it can vary from being a usual day in your life to a typical day during holidays or to a relaxing day in your life. The answers can be endless, since it is an open-minded question. Usually the interviewer will specify you if they ask you about your professional life or your personal life. 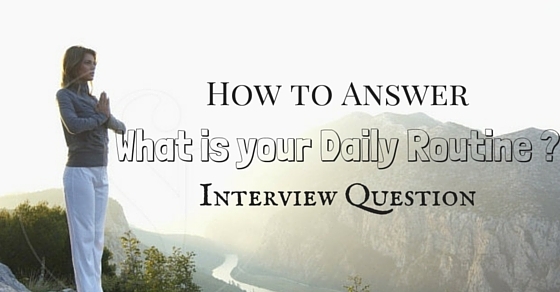 Usually asking to a candidate what is your daily routine is falls under the personal aspect of the question. Here we are few awesome tips for designing your own routine. Why is Daily Routine Important? To get rid of all the unhealthy habits, daily routine is very important. You will be utilizing your extra time, without wasting it. It helps you decrese the anxiety and nervousness you experience. Last but not the least , help you develop good habits and get rid of bad ones. Though I understand that becoming the best version of yourself is tough instantly, but it is not impossible. So for this reason , I have segmented the dialy routines in to four parts. You can begin with one initially and then can add other as per comfort . The answer depends on the individual answering it. If the candidate is a student and is still studying, their daily routines will usually revolve around classes and studying. This might not be the same for a working individual. Their routines are centered around work and managing time. Since I’m a student, my daily routine focuses on studying and classes. I usually wake up at 6:00 am and do my daily routines like brushing my teeth, taking a shower and getting ready for class. After which I check my notes and revise for the day. I leave my house a bit early, so as to not get in the morning traffic. I usually cycle to the university. I reach the university by 7:30 am and I check my schedule to see which classes are there for the day. Classes start by 8:00 am and ends by 1:00 pm. After classes, I hangout with my friends for a while and go back home. I reach home and then usually take a nap till 4:30 pm. After taking a nap, I go out and play. I usually come back by 6 and have a bath. After which I get ready to study. I study till 9:00, after which I check into my social networking sites and spend 1-2 hours on the internet. By 11:00 pm, I go to sleep and I follow the same routine again for the next day. I follow the same routine since I was in high school, since it helped me manage my time a lot. The above examples are usually more suited for students (more preferably college students). When asked for the daily routine try to define what kind of duties you do for the day. For example, when do you come to class, what do you do after college, how productively do you use your time, do you follow any hobbies in between, do you help others during the day. These factors matter when the interviewer is assessing you as a person. Give the person asking this question, a rough idea about your day. Do not tell any lies. Try to be as honest as possible. Moreover, also include what you do during your holidays and how you relax during the weekends. What do you do when you get a holiday? For my holidays, I usually go to my home town. I reside in the city because of the work, and whenever I get a holiday from work, I try to use this opportunity to meet my parents and my siblings. My typical holidays lasts usually for 4-5 days or even more on special occasions. The time I stay with my family and friends, those moments I enjoy a lot. I do a lot of interesting things such as swimming in the nearby lake, looking after the garden, helping my parents with their work and so on. The reason why I love visiting my home town is that, coming to the home town makes me loosen up all my nerves and makes me feel refreshed. Also, it is a great way of joining and having fun with the family and keeping up with the family and other happenings. 1. Where do you go for your holidays? 2. How do you spend your holidays? 3. Whom do you go with during your holidays? 4. Also, add anything interesting that happened during the holidays. While talking about this topic, you can add as many activities as you want. You can limit it to a single activity, if you are confident enough to specifically discuss about it. Take notes on how you spend your holidays. Activities should not only be outdoor activities, it can be indoor activities too, unless the interviewer specifies what kind of activity it is. In abroad, holidays are considered as form of vacations and you can talk about vacations as well. You can also add if you had participated or seen any religious or social festivities that has happened while you were visiting. For me, as a student who just finished studying, even when there are no upcoming classes or exams, I just try to spend my time with ease and with a calm mental repose. This makes me feel refreshed and recharged for the day. During such days, I usually get up a bit late from my usually waking up time. After that I freshen up and have a hearty breakfast. After breakfast, I sit down and make a list of chores that I have to complete for the day. I try to be as productive as possible during my leisure time. After which, I go to the nearest supermarket and get all the groceries that I need for the rest of the week. Also, I try to do my chores, such as getting the tyres fixed, mowing the lawn, looking after the garden, cleaning the house and so on. These duties usually take up some time and by 12:00, I get most of them finished. After which I rest for a while by watching a movie or taking a nap. Then, I get up and make lunch for myself and call up my friends, if they have any plans to spend time for the evening. Then I would usually go meet up my friends by 4:00 and spend a couple of hours with them, talking about various topics or doing some activities like cycling, playing any kind of sports and so on. By 6:30, I come back home, take a shower and I usually check my social networking sites. I usually spend 1 – 2 hours, this includes checking my mail, future schedules and so on. The day usually ends with me having dinner, watching television and going to bed by 11:00 pm. During December, I usually get holidays for Christmas vacations. Usually it is 4-5 days long. I decided to visit my home town with some colleagues from work. I invited them to come and visit my home town and they accepted my invitation. I introduced the customs and traditions of my home town during Christmas to my friends. Then we visited some famous locations near our home town for sightseeing and did some Christmas shopping. I introduced my family members to my colleagues and we had a family outing. We played games and had fun. After that we all assembled for a family dinner. This was a moment to cherish, because all of my family friends and colleagues were there so it was a fun event. This holiday was advantageous for me in a spiritual and an intellectual way, since it helped me relax my nerve and be prepared for future tasks. Don’t get excited by hearing this question from your employer. Though this question might sound simple , but it has all the stuff that your employer wants to hear from you. You employer will be smart enough to ctach even the minute of mistakes you mak e, but becuase it those mistakes that can cost your job. So before answering the question, take a minute time to think about it and craft the answer smartly. It is better to put yourself in the interviewer’s shoes and think what type of answer will impress him. As you will be doing your work for many years, you will obviously be well knowing all the tasks that you do on daily basis. Craft your answe in a format and convey your interviewer through your answer that you make good use of your time. Around 7.30 am, I head for a walk. From 10 a.m. to 11 a.m., I’ll do a few different things: work on a project, reply to messages from key members of my team or complete a number of small tasks. From 11 a.m. to noon, I’ll relax a little by eating lunch, reading a nonfiction book for 30 minutes, running a few errands or driving to a nearby Starbucks coffeehouse to get out of the house. The 12:30 p.m. to 6 p.m. time-slot is very flexible. Depending on the day (and specific deadlines), I do a number of things: write for a few more hours, clear out my email inbox, work through the steps of a current project, record a few podcast episodes or outline a future idea. 6 p.m. to 7:30 p.m. (or sometimes 8:30) is exercise time. I either do another walk (usually with my wife) or go for a run. If I’m training for a marathon, sometimes the long run will extend into the evening. After 8 p.m. is relaxation time. My wife and I will eat dinner, do a little cleaning and basically unwind for the rest of the night. At 11 p.m., I’ll go to bed and do a little bit of fiction reading. I usually fall asleep around 11:30 p.m. If you get questions like this, try to include any kind of holiday you want. It necessarily doesn’t have to be a religious/ national/local holiday. Try to include any kind of holidays that you like. Another factor you have to keep in mind is the word “recently”, do not try to include holidays no more than 10 months old. Try to include holidays as recent as possible, so that you could specifically remember the details. Holidays can be a day that is celebrated widely by people. Not just religious holidays like Christmas. Since, the first part of the question is what kind of holiday it was, give a brief description of the holiday and when and where it was celebrated if possible. Do not turn the whole question into a lengthy 45 minute talk. Try explaining your holidays within 5-6 sentences. The second and third part of the topic includes what did you do during the holidays, do not make it dull by saying that you spent the whole day indoors watching television and eating junk food. The interviewer expects you to say something exciting about your holiday. Try to make it a bit more fun and add unusual activities that you did. Then, as a closing statement give your opinion about your holidays. Express the reason why it is special to you and how it has helped you to get through work. 1. What is your idea of a perfect holiday? 2. Why are holidays considered so important in many parts of the world? 3. Do you consider holidays as a necessity? 4. Is it important to follow traditional customs during religious holidays? 5. What are the changes and behaviour of people towards holidays for the past decades? 6. Do you think a religious holiday is celebrated differently in different countries? Try to include common things that people do on their holidays to make it more relatable. 1. Taking a break from office or professional life and spending leisure time with family and relatives. 2. Cooking and preparing special dishes and visiting locations during holidays. 3. Visiting their respective home towns and spending quality time with family. 4. Doing shopping during the holidays. 5. Visiting other places or cities for sightseeing. 6. Maintaining social relationships and hence meeting families and relatives in their home town during holidays. 7. People looking after religious rules and traditions during religious holidays. Another important aspect is exploring a new place while on a holiday. This shows how adventurous you are in life. During my summer vacations, I decided to go on a trip to Kerala. The reason why I chose Kerala was the fact that it attracted me with it’s natural beauty and calm atmosphere. I went to Kerala during my holidays and spent a whole week. It was a new experience for me, because i got to experience a wide variety of activities like trekking, sightseeing, bird watching and camping. It was the first time I made food for myself in a camp site. After that I went to a nearby animal sanctuary and went on a safari. It was a new and an overwhelming experience to see animals so up close. After the safari, me and my friends who were accompanying me in this trip, came back to the city and had traditional and homemade food for lunch. The weather made it even better to enjoy the food. To explore a new place was eventful. It made me evaluate myself as a person. Also, it made me forget about the tensions from work and the rigorous day to day life activities. So,next time if anyone asks what is your daily routine, give a better answer to them.